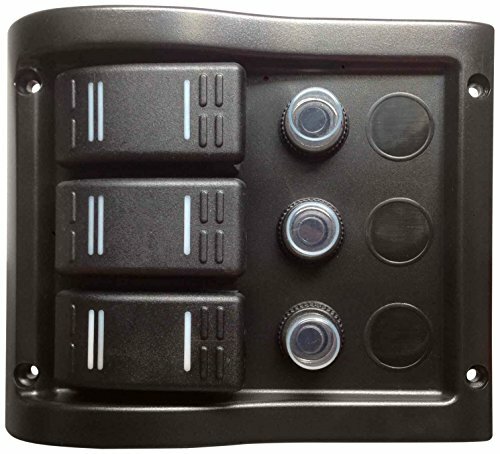 Pactrade Marine Boat 3 Gang Splash Proof Switch Panel ODM Circuit Breaker with Caps by Pactrade Marine at Zvejo Tribuna. MPN: P10013BK. Hurry! Limited time offer. Offer valid only while supplies last. 3 Gang splash proof switch panel with 2x 10A and 1 x 5A circuit breakers with caps. 30 Preprinted labels included. Made of high quality PC plastic. 3 Gang splash proof switch panel with 2x 10A and 1 x 5A circuit breakers with caps. 30 Preprinted labels included. Made of high quality PC plastic. This panel can be mounted vertically or horizontally. 12V dc 5.12 Inch x 4.33 Inch . 1 Year limited product warranty see below for details. Item number: P10013BK (in inch) depth length width dimensions 5.12 4.33.